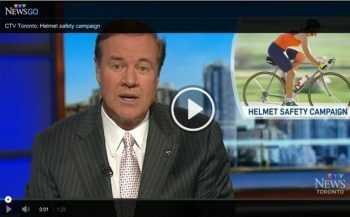 A group of not-for-profit organizations, dedicated to promoting the proper use of bike helmets. Our goal is to reduce head injuries from cycling by encouraging people to wear a properly fitted helmet. To learn more about the 2-V-1 rule, please check out Fitting a Helmet Properly below. It’s your head. Use it. Wheeled activities are a great way to get active, have fun and stay healthy. Remember to stay safe while having fun. A head injury can permanently change the way a child walks, talks, plays and thinks. Wearing a helmet will help protect your head. Children and youth under 18 are required by law to wear a helmet when cycling in Ontario. 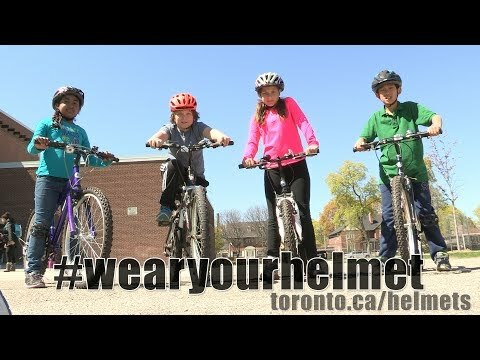 Toronto Public Health encourages all people participating in wheeled activities (bikes, scooters, inline skates/roller blades, skateboards) to wear a helmet, regardless of age. Wear a helmet and be a good role model!